This evening, in the rooms of the Austrian Parliament, the winners were presented of the international photo competition for the best image of peace, now in its sixth year. The main award, Peace Image of the Year 2018, named after the 1911 Nobel Peace Laureate, Austrian Alfred Hermann Fried, and worth 10 000 euros, went to California-born photojournalist Anna Boyiazis for her photo series about the Panje project: Girls on the island of Zanzibar, which is part of Tanzania and dominated by Islamic rules, claim the right to disregard the ban on women swimming. 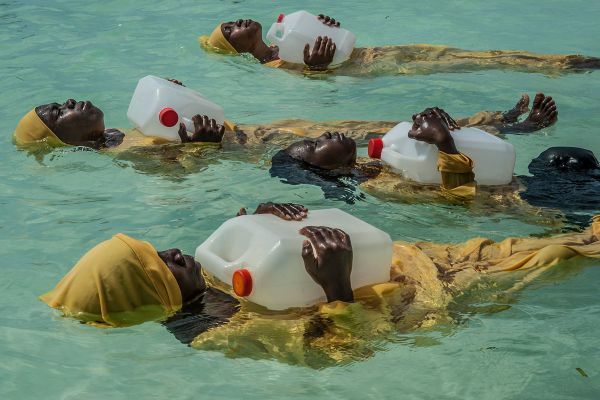 The jury commended Boyiazis’ photo report for showing, in a small story, something very big: the desire for freedom and the self-assertion of women. The award was presented jointly by the President of the Austrian National Council, Wolfgang Sobotka, and sponsors Silvia Lammerhuber of Edition Lammerhuber and Hansjörg Hosp of Megaboard. With an image of peace, understood as a state of rest in comfort and safety, 14-year-old Kaja Tasevska from Skopje, Macedonia, won the Best Children Peace Image of the Year, also worth 1 000 euros. Patron of the Young PeopleCategory is human rights activist Waris Dirie. In his introduction, Wolfgang Sobotka, President of the Austrian National Council, emphasized that peace was more than the absence of war and violence, “peace is an attitude”. And it was the responsibility of journalists to find the story behind the excesses, to bring truth to light and to be trustworthy. Sobotka said that the photo reports would touch as many people as possible. In the presence of Hannah Lessing,Lois Lammerhuber, initiator of the Alfred Fried Photography Award, with moving words and a minute of silence, paid tribute to her father Erich Lessing, long-term honorary head of jury and one of the greatest photographers of our time, who recently took leave of his world career for good at the age of 95. Nadja Schmidt, Director & Co-Initiator of ICAN Austria – International Campaign to Abolish Nuclear Weapons Nobel, winner of the Nobel Peace Prize in 2017, gave the keynote. She reminded the audience of around 250 guests that “peace starts with every single person”, but at the same time there was something bigger on the agenda: an international ban on all nuclear weapons. Anyone calling this goal unrealistic should remember that the world community had also succeeded in outlawing chemical and biological weapons. And in the long run only one thing would survive: either nuclear weapons – or humanity. This year’s head of jury, Lars Boering, Managing Director of World Press Photo in Amsterdam, said the Alfred Fried Photography Award was “more than a competition”. It was a symbol of international cooperation. Boering also declared that he was proud that the jury, in its decision to award the work of many women, had expressed an encouragement for women photographers. Elisabeth Stadler, Director General of the Vienna Insurance Group, which for the second time supports the Children Peace Image of the Year Award, pointed out that thinking in terms of generations to come and taking on responsibility had informed the core business of the insurance group from the start and still did. The Vienna Insurance Group focused on supporting intercultural diversity and connectivity, encouraging intercultural competence, with special emphasis on children and young people, “because children are our future”. Dutch photographer Selma van der Bijl for capturing moments of boundless joy as refugee families are reunited. Tehran-born Maryam Firuzi for a fairy-tale staging of reading women in the streets of the city, which the Iranian photographer and filmmaker understands as a plea for the power of poems to unite peoples. German-born, Sweden-based, photographer Nora Lorek for her portrait series of women who have saved their most important possession on the flight from South Sudan to Uganda. Argentinian photographer Constanza Portnoy for her empathetic photo story of a family in which love, respect and confidence win over severe physical disability of both parents of a daughter.